An Ace Of An Idea! 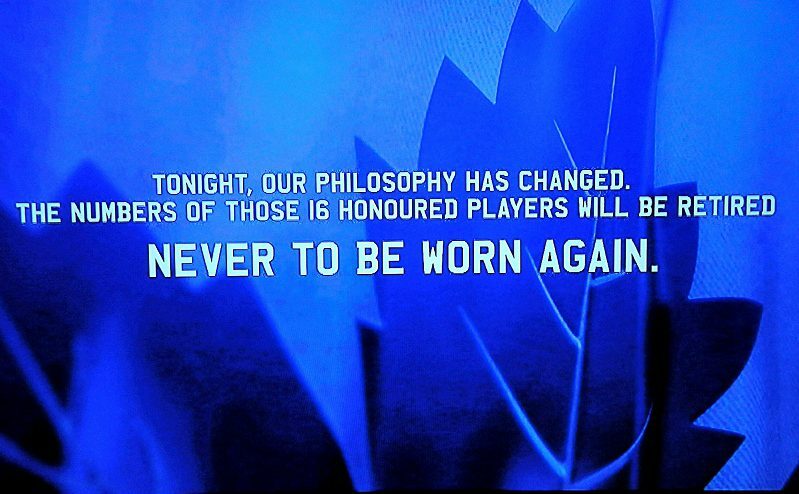 As you likely know by now, the Maple Leafs’ lavish ceremony on Saturday night to open the 100th season of NHL hockey in Toronto was a huge success. After years of choosing to “honour” players numbers but keep them in circulation, the team announced it would retire those numbers – as every other team in sports does for its greatest franchise heroes. What Dave Keon had long perceived as this lack of proper recognition is what had kept him away from the team for so long, rather than any lingering resentment over his feud with Harold Ballard. 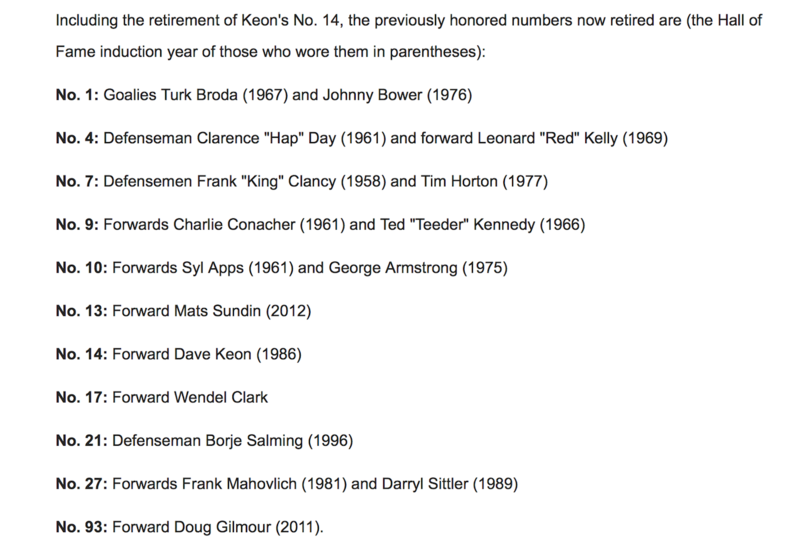 Now Keon is back, and while I might quibble with his selection as the number-one player in Leafs history, his number 14 has taken its rightful place among the rest of the team’s greats. In the past, the Leafs had only retired the numbers of Bill Barilko (5), who was famously killed in a plane crash after scoring the Stanley Cup-winning goal in 1951, and Ace Bailey (6) whose career ended in 1933 when he fractured his skull after being knocked to the ice by Boston’s Eddie Shore. Even so, James van Riemsdyk was the only current Leaf wearing one of these newly retired numbers, and he gladly gave up Borje Salming’s now-retired 21 and took 25. I have read accounts from Teeder Kennedy saying how pleased he was when he was given the number of his hero Charlie Conacher, and I know that Darryl Sittler has talked about his belief that the team had big plans for him because he was given Frank Mahovlich’s #27. But the only Leafs story I’m aware of where a player literally handed his former number to a current player was when Ace Bailey requested that Ron Ellis be given his #6. Bailey handed his number to Ellis in a ceremony at the Hot Stove Lounge at Maple Leaf Gardens on September 24, 1968. “My family and I wanted to see somebody wear the number while I was still active in hockey,” said Bailey, who was a timekeeper at the Gardens. “Ron is a real hockey player who never gives his club any trouble. I think he’ll be an all-star in years to come. “I’ll wear this sweater with a great deal of pride,” Ellis told him. 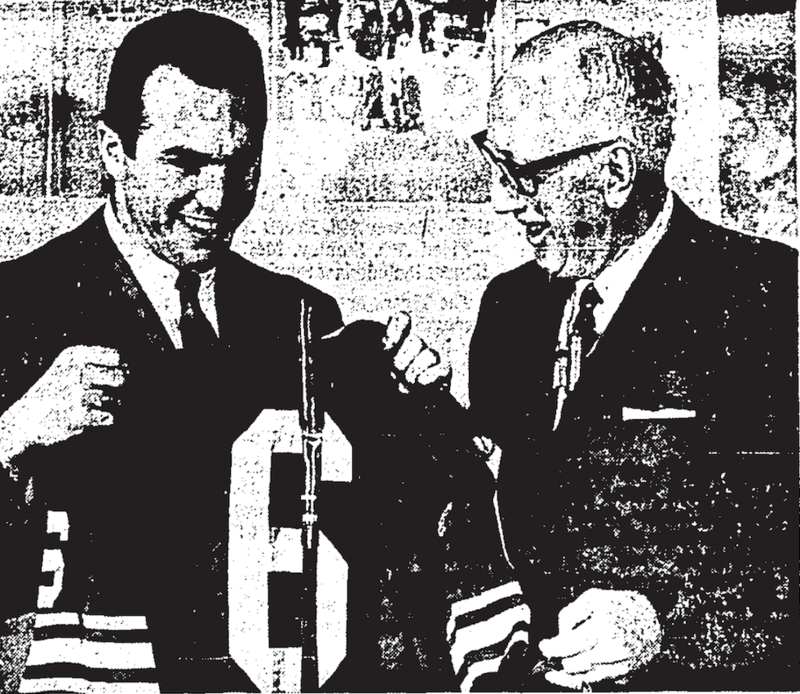 But as the Toronto Star noted the following day, Ace Bailey handed a #6 sweater to Ron Ellis, but not the #6 sweater. Bailey had kept his retired jersey for nearly 30 years, but it had recently been discovered that it was missing! Speculation was that Bailey’s sweater may have been destroyed a few years earlier when a drain backed up at the Hall of Fame building and flooded some storage rooms, or that a workman might have made off with it during recent renovations there. I don’t believe the sweater has ever turned up. Great article, as always, Eric and essentially a GREATER move by current Leafs management to correct a longtime embarrassing and sadly ignorant situation. However, while I appreciate your usual gentility and humility in not wanting to ‘rock-the-boat’ in what is, for the most part, a wise, celebratory, progressive and long overdue righting-of-a-wrong (Regarding the retirement of players’ numbers.) I would go much further than your using only the word “quibble” in regards to the ‘naming’ of one Dave Keon as the “…number one player in Leafs history…”. I have not communicated with anyone who is not at least somewhat taken aback at this and all are in unanimous and strong disagreement with this singling out and stated designation. The consensus is that no one player, through Leafs history, could POSSIBLY be singled out as its ‘number one player’ but especially not one who has harboured so much hate, YES, hate, disdain and resentment towards ‘The Leafs’. Through history, Mr. Keon certainly had not the slightest care, nor regard, for the team, for ‘LEAFS NATION’ nor even his own, long admiring fans. Methinks there is still “Something…rotten in the state Denmark.”. I seriously suspect that a ‘deal’, similar to a ‘plea arrangement’ between prosecutors and the defence in a criminal trial, was concocted and executed between the Maple Leafs organisation and the longtime embittered, mulish, curmudgeon and grudge-holding grinch who proferred ‘the bird’ to all Maple Leafs, Maple Leaf fans and would-be peacemakers over the decades. Most of those peacemakers represented an organisation and entity that had absolutely no connection to the INDIVIDUALS who, in his mind, slighted him so long ago. He has been arrogant, miserable unapproachable and boorish. Any hint at any such thing as a smile that I have ever witnessed upon his countenance has been, at best, a condescending smirk. Without his participation and inclusion the whole grandiose, well-intentioned plan would have come off as, at best, a charade. Mr. Keon had them over-a-barrel and he remained true to the spirit of Dave Keon NOT the spirit of The Toronto Maple Leafs right to the end. He won! Now, Emperor David Michael Keon sits triumphantly and smugly, with a smirk on his face, looking down at his humbled, enemy who has, hat-in-hand, capitulated to his boorish, childish, almost ‘Trumpish’ unforgiving nature and antics to a crime that mostly he, and he alone, perceived to have occurred with anything remotely close to the severity and degree inherent within that perception. The honest truth is, my disagreement with Keon as #1 is that I simply don’t believe he’s the best player in franchise history. And where oh where is the REAL #6????? LOL…. Humm, I was ready to suggest that you do a piece on all the clubs’ retired numbers; but after reading this, maybe that’s a wasp nest that you don’t want to disturb.